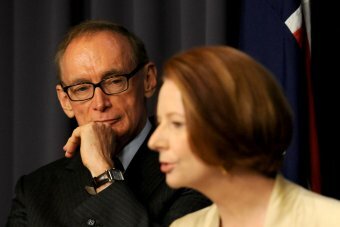 Former foreign minister Bob Carr has hit out at what he calls the "pro-Israel lobby in Melbourne", saying it wielded "extraordinary influence" on Australia's policy during his time in Julia Gillard's cabinet. Speaking to ABC's 7.30 program, Mr Carr said "extreme right-wing" pro-Israel lobbyists had an "unhealthy" influence on Australia's policy towards Israel and the Occupied Territories. Mr Carr details his time as foreign minister, and his criticism of the pro-Israel lobby, in his new book, Diary of a Foreign Minister. "I found it very frustrating that we couldn't issue, for example, a routine expression of concern about the spread of Israeli settlements on the West Bank - great blocks of housing for Israeli citizens going up on land that everyone regards as part of the future Palestinian state if there is to be a two-state solution," he said. "The important point about a diary of a foreign minister is you shine light on areas of government that are otherwise in darkness, and the influence of lobby groups is one of those areas. "What I've done is to spell out how the extremely conservative instincts of the pro-Israel lobby in Melbourne was exercised through the then-prime minister's office." Mr Carr and Ms Gillard came to political blows over her planned support for Israel during a crucial vote in the United Nations. "I had to resist it, and my book tells the story of that resistance, coming to a climax when there was a dispute on the floor of caucus about my recommendation that we don't block the Palestinian bid for increased non-state status at the United Nations," Mr Carr said. The national chairman of the Australia-Israel and Jewish Affairs Council, Mark Leibler, has rejected Mr Carr's claims as "a figment of his imagination". "Just unpick for a moment what he's saying. He's talking about the Jewish lobby, he's talking about a difference of opinion between him and the prime minister," Mr Leibler told Lateline. "Why can't they have a difference of opinion on a matter related to Israeli policy? "No, if there's a difference of opinion ... the prime minister has to be wrong because she's controlled by the Jewish lobby. "How does the Jewish lobby control the prime minister? Through donations to the ALP and sending people to Israel. I mean, give me a break. Would anyone seriously accept that?" Mr Leibler says he was able to raise concerns with Ms Gillard in the same way he raised them with Kevin Rudd, John Howard, Paul Keating, Bob Hawke and Malcolm Fraser. "Julia Gillard is an independent-thinking woman. She can come to her own conclusions without being influenced by the Jewish lobby," he said. He says the council's lobbying of governments is no different to other community organisations. "When we've got an issue which is a serious one, which needs to be raised, we haven't had a problem in getting access to either ALP or Liberal prime ministers or foreign ministers and so it should be," he said. "Any representative of a community organisation, if they've got something serious to say, they'll get the access." Mr Carr, who switched his support to Kevin Rudd just before the leadership ballot which ousted Ms Gillard, says Ms Gillard was selfish to cling to the Labor leadership for as long as she did. "Before the final leadership challenge I thought if someone had presented me with appalling [polling] figures about the state government in New South Wales [when Mr Carr was premier of that state] that said you're now a significant barrier to the government's re-election, I would've said, 'look fine, I've done my best, it ain't working, I'll pull out', and apart from anything else I won't be the one indicted with the responsibility on the Sunday after [the] election," he said. "We all wanted Julia to work. Even after my disagreement in October/November 2012 on matters relating to Palestinian status and the Middle East, I was still committed to her. Mr Carr's diary, extracts from which were published in news outlets on Wednesday, includes tips on buying ties, complaints about business class flights which he likens to being locked in a slaving ship, and notes on the perfect breakfast and his obsessive exercise regime. Mr Carr told 7.30 that he lost weight in his first month as a jet-setting foreign minister because of "living on planes" and eating "inherently unhealthy" airline food which "I thought would've knocked about two years off my life". "Living on airline food and food at official banquets offended every rule of life I adhere to on this front," he said. Faced with a choice, having to get off a plane and go straight to a meeting with the French foreign minister in Paris, I tell you what, I'd prefer first class any time. Asked if he was being a "prima donna" because he complained about not flying first class, he said: "Faced with a choice, having to get off a plane and go straight to a meeting with the French foreign minister in Paris, I tell you what, I'd prefer first class any time". "I think they [the complaints] add colour and authenticity to the book." "Yeah. I think self-parody and irony is the stuff of life. And I wanted the book to have that flavour. "The flavour is me. [It's irony]... and fun. A sense of fun. Life is too short to be taken seriously. "I think we've got an obligation to share with the Australian people how it works. And I can't think of a book, if I can be so immodest, I can't think of a book like this that takes the people into confidence in a whole host of ways. And I think the political system is the better for it."